Heartworm (Dirofilaria immitis) is a parasitic worm that lives in the heart and lungs of a dog. Heartworm is transmitted to dogs though the bite of a single mosquito that is infected with heartworm larvae. 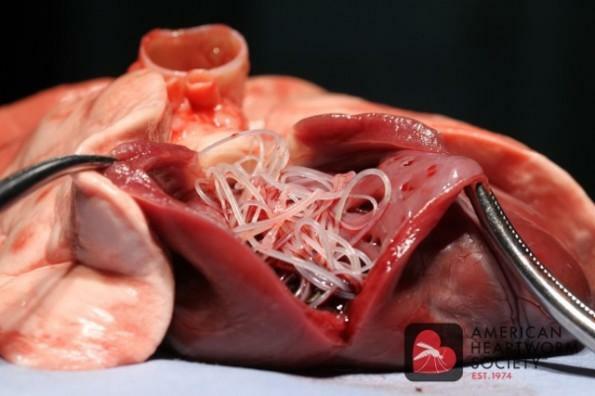 The heartworm larvae slowly grow in the heart to become adult worms. Adult heartworms prevent the regular flow of blood through the heart, which can lead to congestive heart failure and death. How do you know if your dog has heartworm? In the early stages of heartworm disease, a dog will have no symptoms. As the worms mature, a dog may develop signs of heart disease, such as a cough, exercise intolerance or weight loss. By the time a dog shows symptoms associated with heartworm disease, they are generally in the advanced stage of disease. We recommend yearly screening for heartworm in the form of a blood sample. The test can be performed by a Registered Veterinary Technician in the clinic. That same sample is also used to screen for tick-borne diseases, which are becoming increasingly prevalent in Ontario (there have been Lyme positive tests in Perth and Huron County). We generally recommend that a heartworm test be done in the spring. Here is a map of Ontario that shows the location and number of dogs that have tested positive for heartworm since the beginning of 2017: http://www.petdiseasereport.com/content/prevmap.aspx . If you travel with your canine or adopt a dog from the States, keep in mind that the incidence of heartworm is greater in the warmer climates, where the temperature supports mosquitoes year-round. Stay tuned for Part 2 of our heartworm blog next week.